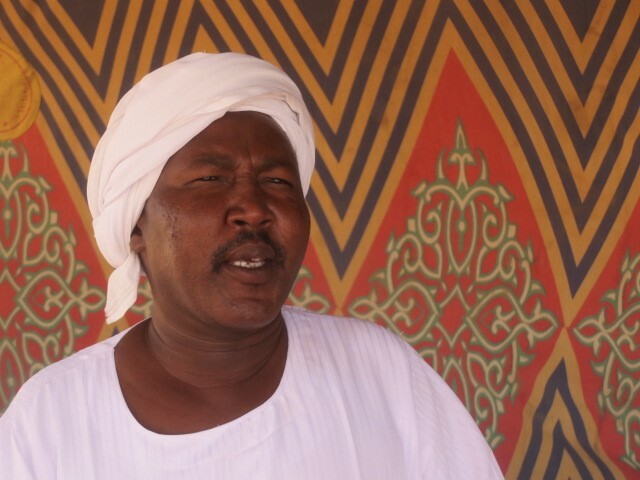 The thing girls fear most in Darfur is childbirth. The incidence of death or fistula in the remote villages of Darfur is amongst the highest in the world. People move to villages when they know there is a trained midwife. Few villages have health care of any sort. For the past 18 years Kids for Kids has funded the training of village midwives and these brave women have transformed the survival rate of both mothers and their newborn babies. In December, the latest 34 Kids for Kids village midwives returned to their homes. “We are completely blown away by the exam results of our new Kids for Kids midwives!” said Sage Lancaster who now works for Kids for Kids having learnt about their sustainable projects when she was at school in Hampstead, London. Every year Kids for Kids trains new midwives from our adopted villages, empowering them to learn new skills, master a profession, and earn an income – changing their lives dramatically. In our last training session, 34 women from Kids for Kids villages studied in Khartoum, and scored some of the best exam results of their whole graduating class! They are now all officially qualified and have returned to their villages in Darfur to start saving lives. Our Project Leader, Hassan, had a chance to speak to Munira at the celebration we held for midwives in El Fasher who graduated on December 10th. Munira said “I was very afraid when I left our village to go to Khartoum where we were all taught at the Midwife Training School. It is so different from our village, and so far away. We had to fly there!” Up until that journey Munira and her friends had only ever travelled on a donkey, as there are few roads in Darfur. 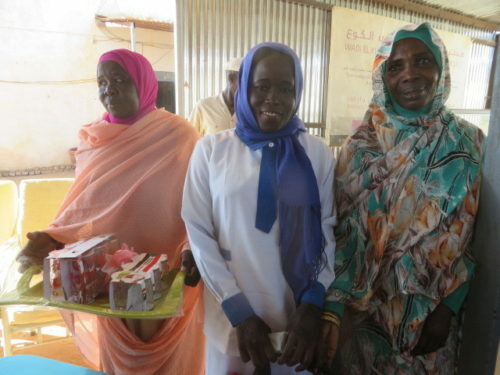 These brave women have now returned to their own home villages in Darfur where they will help deliver the babies of their neighbours and friends. These extraordinary women have been given the knowledge and tools to ensure their loved ones are kept safe in their homes where there is so little access to health care for pregnant women. How incredible! New Midwives Singing at December’s Graduation! For more information about our Midwives please look here. To support the training of our new midwives this year please donate in our online shop, specifying at check out for the donation to support midwives – or even fund one midwife’s entire training here! If you are supporting from outside of the UK, please donate via our Global Giving Project! The worst year ever in Darfur? During our recent Programme Meetings with our Darfur team we were shocked to learn of the extent of the failed harvest which means families, particularly those in out of sight villages, have nothing to eat until the next harvest – which is not due until the rains come in late summer. The result is famine. Yet the world has not responded to a call for aid. We must help. We are not an emergency aid organisation, but the thought of families struggling, and children, and their animals too, dying, is appalling. We are already sourcing flour and fodder, plus seed for families to plant for next year. Please can you help? You can donate to our Urgent Need appeal here. 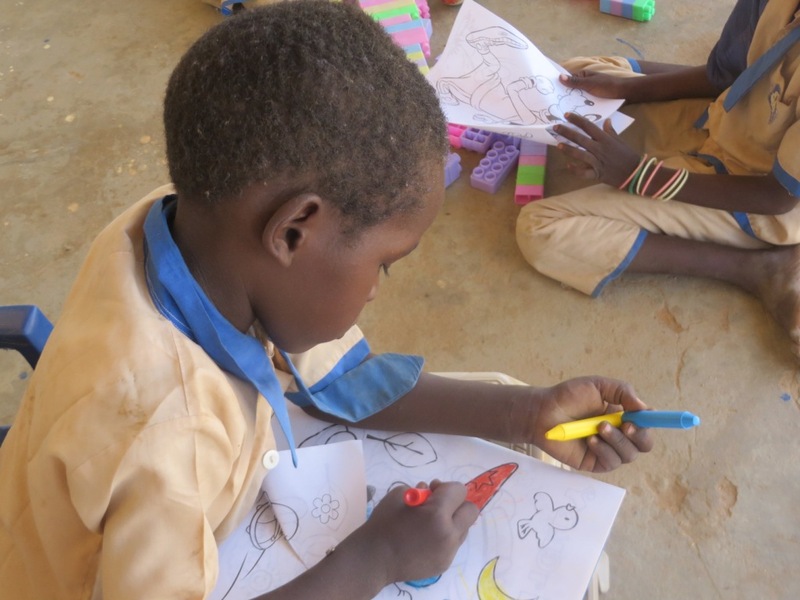 To see how we will be tackling what are some of the most challenging times that villages in Darfur have ever had to face since Kids for Kids started in 2001, please take a look at the following links. The links include information on the current situation and how we are planning to help. There is news of what has been happening at Kids for Kids over the last year, all the different ways that you can get involved now to give your support, and invitations to our Events. Those of you who have joined us will know what treats are in store! This year they range from a Spring Supper and Wine Tasting, to our wonderful Ambassadors’ Ball and Candlelit Christmas Concert. I am opening my garden in Surrey to a Summer Caribbean Festival where we will also be holding our Friends Event when I have a chance to give you a full briefing on why Kids for Kids is so different from other charities, and so effective. You will be pleased to hear that our team in Darfur said that our Goat Loans are ‘The Gold Standard’. We are determined to get help to as many families as possible, in time to avoid the worst ravages of starvation. Your support was never more needed. Thank you. Looking forward to seeing you. 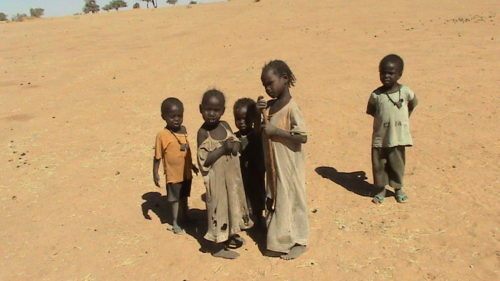 Urgent Need: Starvation is a real risk for Children in Darfur this Summer. Summer has barely started, yet temperatures in Darfur are soaring. Children and animals are likely to die if we do nothing. The whole of Darfur is now reported to be in crisis and in those areas where there is no humanitarian aid available, which includes the villages, the level of need is even higher. This is an emergency. Please donate to our Urgent Need Appeal now. Famine Disaster Relief reported as long ago as October last year that areas of Darfur were in crisis even then. Failed harvest, for the second year running, has left people with virtually nothing to enable them to survive the coming months. 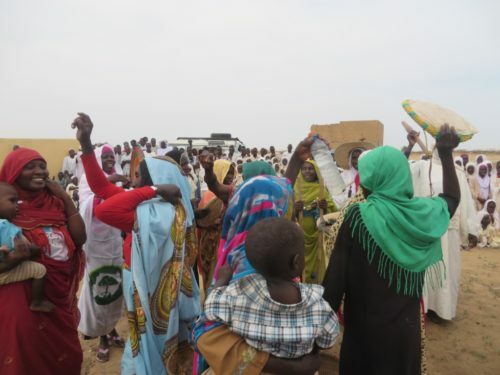 Combined with soaring inflation and the drastic devaluation of the Sudanese pound to a third of its value, every village is asking for help. Starvation is a real and frightening spectre for the coming months. The Government of Sudan does not normally ask for help, but earlier the Governor of North Darfur called for urgent assistance. This is an indication of just how serious the situation is. We cannot stand by and do nothing, so we have launched an appeal that will enable us to give help in this emergency. This will be in addition to providing sustainable help through our programme of integrated grass roots projects. Our long experience has shown that enabling people to help themselves, especially to help them diversify from sole reliance on the subsistence crop, with our goats, gives them the resilience to withstand disasters. But even in our villages people are worried. Those with no animals have little chance without help. But not one organisation has responded to the appeal for aid. One of the problems is making sure families have enough stored food to keep their animals alive throughout the summer, until the rains come. When the harvest fails, the grass is also sparse and it is this which they save and turn into hay, plus crops such as watermelon. I have already asked for a report of which villages are likely to be hit the hardest. The list is long. We need to provide flour for the families and fodder for the animals right now. Donations can be made in set amounts between £10 and £100. If you would like to give more, please transfer online to the Kids for Kids’ account with the reference ‘urgent need’. For more methods of payment, please see How to Donate. 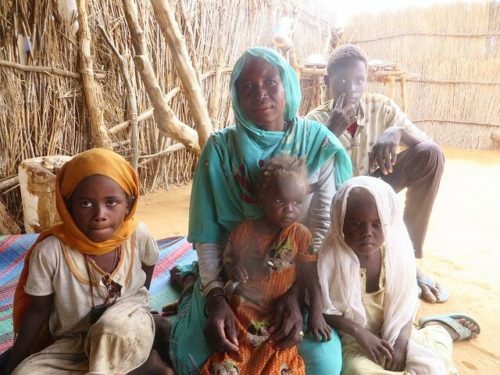 2018 has not started well for the villages we support in Darfur. The harvest has failed and we are worried how families will cope. In fact, Famine Disaster Relief has put out a warning that areas of Darfur are in ‘crisis’. We have to make sure we are in a position to provide seed and fodder if needed and so, as we start to plan our projects for 2018, we are asking for help through ‘Donations for the Greatest Need’. Your support is vital; we cannot just stand by. We are beyond delighted to announce that we recently completed construction of our Water Yard at the village of Kulkul! The Water Yard has a submersible pump, meaning that people will drink, wash and cook with clean water that is not a risk of infection. The Water Committee in the village has been trained how to run the generator so that any breakdown can be repaired, and the pump does not sit idle. 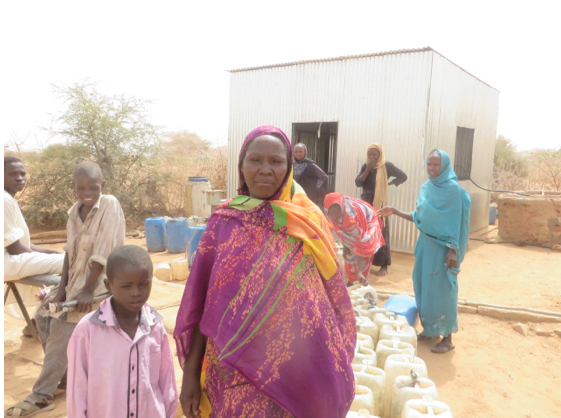 This is Naima with her son, Gamar, visiting the water yard at Kulkul. Naima has 8 children- 3 boys and 5 girls, with 4 of her children under the age of 5. Before the Kulkul Water Yard, Naima and her family were walking to the dam 10km away from their village to get unclean water to drink and bathe with. With this new submersible pump in the village, Naima says her family is much healthier, as they have pure and safe drinking water. We are grateful to our supporters for helping us to in build this incredible Water Yard. Sadly there are many more villages where everyone living in them is forced to walk miles for water. 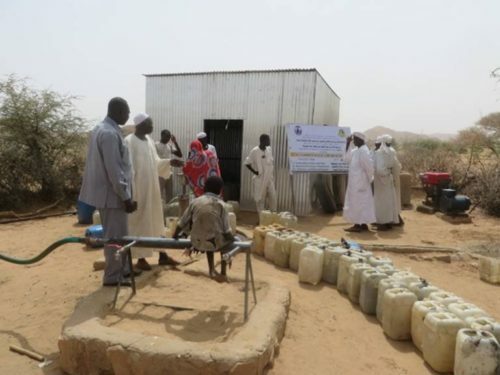 Please help us to improve both the quantity and quality of rural water supplies in Darfur. We have set up a Water Fund so that we have money available as soon as the drill is in North Darfur. We don’t want to delay if there is a chance to change children’s lives so dramatically. Donkeys For Our New Villages! We have adopted our five new villages and our beneficiaries have been chosen! It has been an exciting summer. Absharback, Fardal, Geleidat, Um Jadoul, and Hashab Baraka have been adopted and we have held our Inception Meetings with each community to ensure that they understand the importance of democratically electing not just those who will run our projects, but also the beneficiary families. These are the poorest in the community and we now have all the details of the first 15% of the total families in the village who will become our first beneficiaries. It has been shocking learning how little these families have to live on. It is worse this year than ever before. Our wonderful Project Officer Hassan in Darfur has put together the table below which outlines the way in which we determine how many donkeys we need for each benefitting family in the village. You can see that 15% of the households will be receiving a Donkey! Can you imagine what this means to a family whose total income for the year is less than £80. We will be buying these donkeys in the markets as close to the villages as possible, and along with the donkeys, Kids for Kids will be providing vaccinations, branding, and a shepherd who will be bringing the donkeys to the villages, giving them food and water on the way. Each Donkey costs £60 and with the additional necessities listed, our total spend needed for these 160 Donkeys will be just over £5,000. Here is where we need your help! 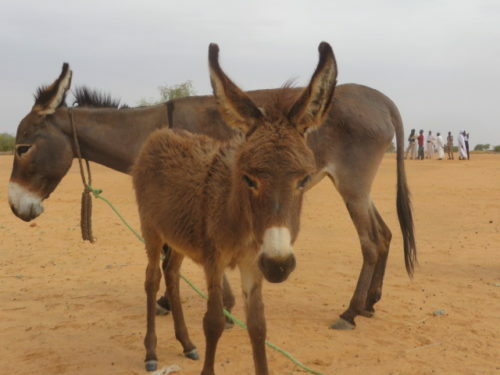 Donkeys are so important to families in Darfur because they are the only form of transport, carrying water, firewood, and people. We want to get them to our families as soon as possible. Can you support us provide these 160 families with a donkey each? Every penny helps us get closer to our goal, there is no amount too small. New Trees Planted at our Kindergarten in Um Ga’al! 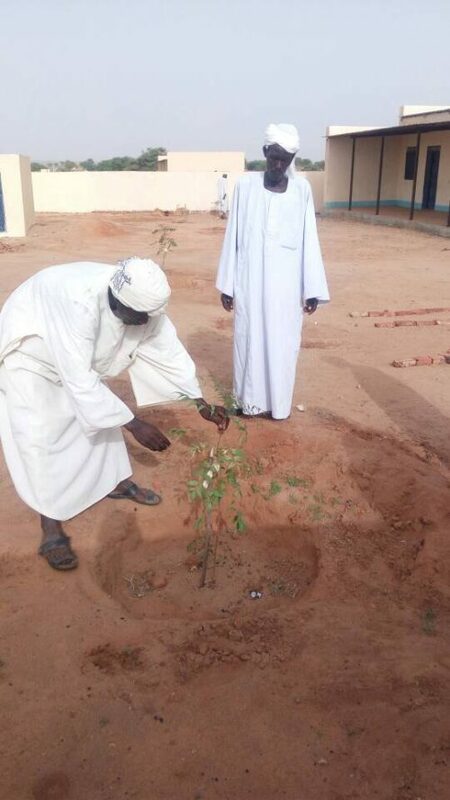 Such wonderful news from our very first village Um Ga’al, where baby trees have been planted at the new Kindergarten! You’ll remember Ibrahim, the 9 year old boy Patricia met in the desert of Darfur over 16 years ago walking hours to get drinking water for his family. Well now his village has a Kindergarten and beautiful new trees planted just as the rains are starting. Thank you so much to everyone who has made all this possible. Last year in Um Ga’al there were floods, which washed everything away, and showed us just how harshly climate change is affecting this region of the world. Darfur is experiencing drastically changing conditions, with desert creep a prime example as the Sahara spreads south. It is so important that we are paying attention to the realities and doing all we can to help those living at the forefront of global warming. Planting these trees will be instrumental in holding back the desert, and of course providing shade to the children at Kindergarten! The long awaited rains arrive! At last the rain has come in Darfur, but it is not too soon for families in Hashab Barakat, one of the five villages we have adopted this year. After two years of drought people are desperate. This is the first time we have heard of so many families asking for help to buy a jerry can. They are vital for life in Darfur – jerry cans are the only way to carry water from the water supply to home–something we don’t even have to think about where we have clean water on tap. Without a container, water, a basic essential, cannot be carried and stored. It is worrying that families in 2017 do not even have enough money for jerry cans. Can we ask your help this month to provide 2,000 emergency jerry cans to villagers? Good news, following our last report in May, we are delighted to announce the opening of the first Kids for Kids mini water yard and submersive water pump in the village of Kulkul. The pump has taken two years to complete and has the capacity to produce 1,000 gallons an hour – this will be life changing for the families living in Kulkul and the neighbouring villages. Kulkul has suffered very much from a severe shortage of water. Many families have been walking 20 miles to reach a handpump. Now Kids for Kids has intervened to solve the problem to produce safe drinkable water for humans and animals. With your help, we can continue to help these families that the rest of the world has forgotten. If you think you would like to help more, please consider making your donation a regular donation for the next two years so that we can make sure no child in a Kids for Kids village succumbs to cholera by providing more safe water supplies. They can’t wait to start school! 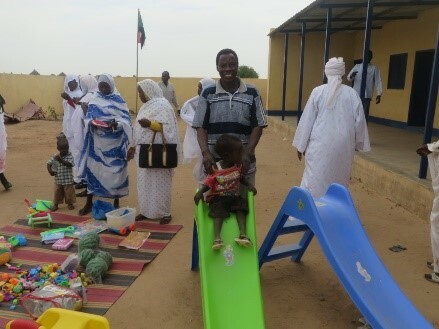 Kids for Kids has been working on building five new kindergartens this year and it is going well! Kindro is one such village. The VDC leader in this village is Adam and he gave us an update on their kindergarten project. Although we are now nearing the completion of all five new Kindergartens, which is incredibly exciting, there is still work to do! 1. Carts to help transport children to school. 3. Recruitment of volunteers teachers and guard and office cleaner. 4. Create a PTA. Under Adam’s leadership we are optimistic that like at our first school at Abu Nahla, the new PTA will make sure all the children enroll. 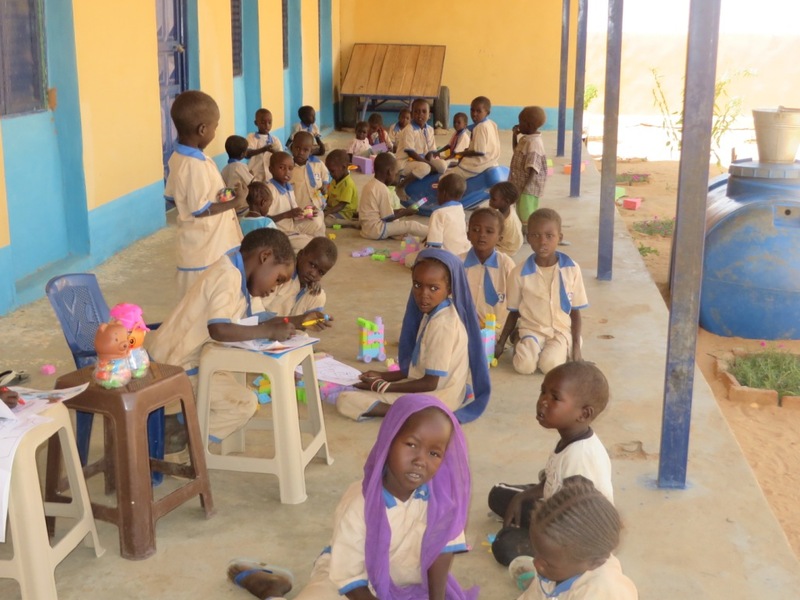 At Abu Nahla families clubbed together to provide bursaries so even the poorest children and orphans could go. From Beneficiaries to Benefactors! Why are kindergartens so important? 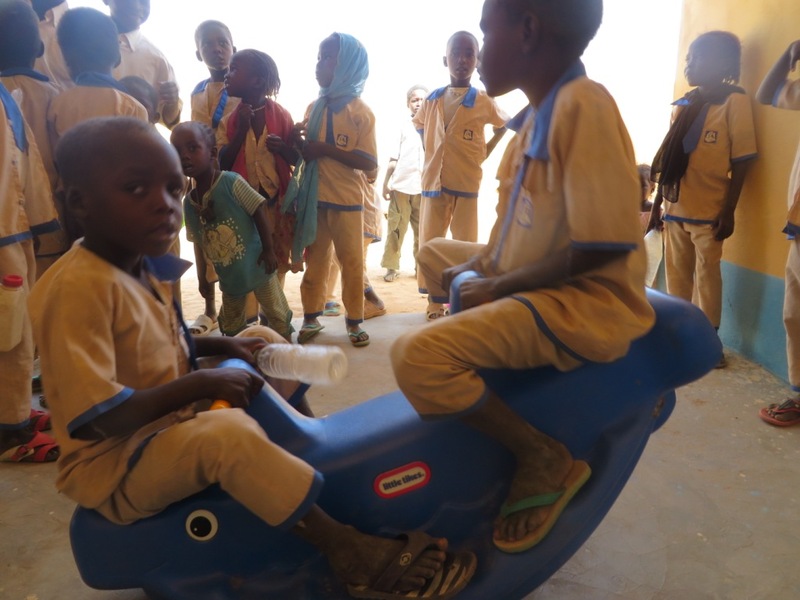 It is as Mary Clark, UN Poverty Alleviation Consultant, says, “The absence of education for young children means that they lack essential stimulation during the crucial formative years of their lives. 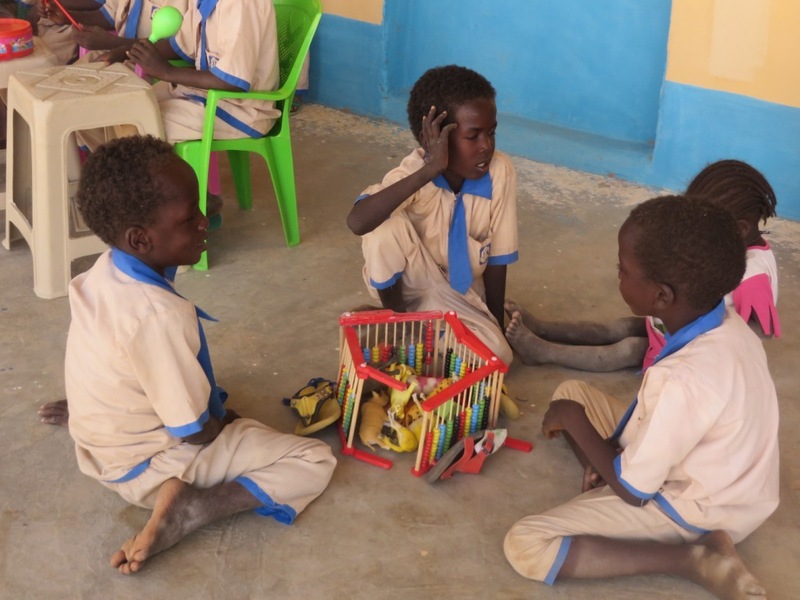 Opportunities are lost which can never be regained, and which diminish the development potential of the children forever.” 98% of women in the villages of Darfur are illiterate, yet they know that education is the best way out of poverty. Through education we can transform lives and improve lives for everyone. Thank you for helping make their dream a reality. Eid is a special time in Darfur, especially when Ramadan has been as demanding as this year when temperatures soared. At the end of the Holy Holiday we were touched to hear about a very special offer of support that villagers have decided to make to ensure our projects are on course. 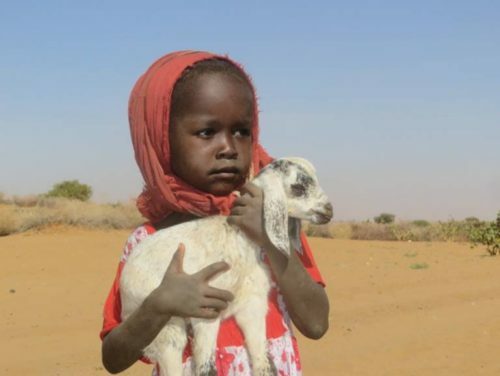 It is as hard for animals to survive in Darfur as it is for humans in the harsh conditions. It is therefore essential to get veterinary care in place before our animals arrive. But our goats and donkeys are needed urgently. Any delay means children go hungry. Each year there is a challenge to finish our Animal Husbandry training for the beneficiaries and our Childrens’ Shepherds’ Committee, and the Paravets training so that it doesn’t clash with the arrival of the rains and the planting season when everyone is needed in the fields. Working the land in Darfur is concentrated on just a short period and is crucial because a successful crop means you can feed your family. All our new villages this year have offered to help the volunteers, who are being trained as paravets, with their planting, so that the training will not have to be delayed, and their families will not suffer. This year they will be back in their villages in time for us to buy the goats at the right time – when the grass is starting to grow and yet the price of animals has not soared. It means too that the goats will have settled into their new homes before they become pregnant and are likely to have an easier, less stressful pregnancy, and successful births. Everyone is watching anxiously for the rains.